Because I'm just that much of a masochist... let's do some 32-QFN packages! ATTINY861 breakout board with status LED and on-board 8MHz crystal. Passes continuity/no-shorts test, next stop is to hand-solder the headers (which promises to be as white-knuckle driving as the pick-and-place was) then see if I can program it via a POGO plug on the ICSP pads. 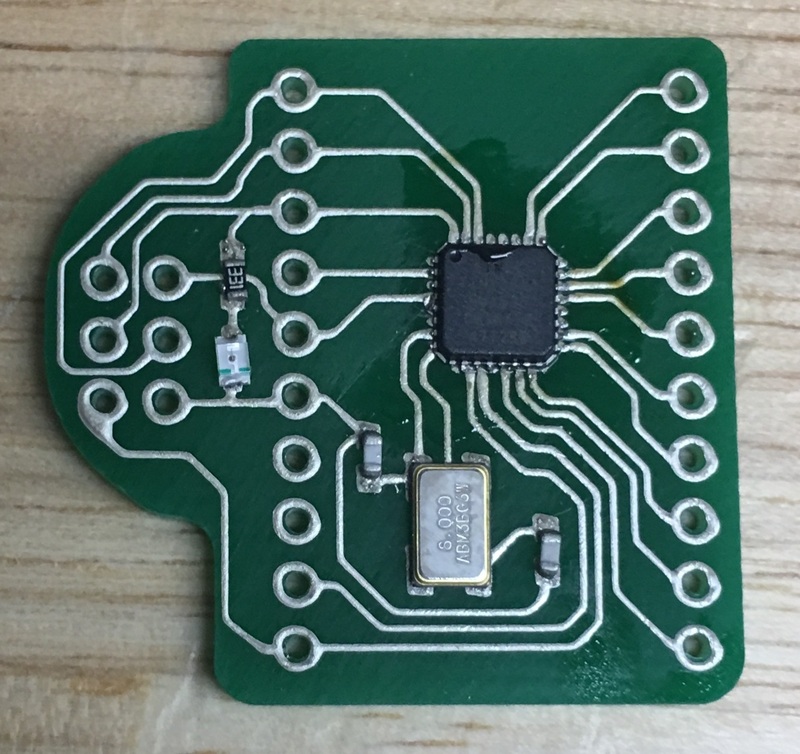 I have done another board that had a QFN buck convertor which failed for other reasons, but with both boards I successfully laid down ink for 0.5mm QFN and reflowed. That said, both times I had to hot-air rework the chip to get it right. The convex geometry of the ink traces make accurate placement/rotation after reflow very, very difficult. So I had to reflow and push down with tweezers to manipulate the chip into place. This pushed excess solder out from under the pads, causing beads and a couple of shorts. Some flux and solder wick fixed that fairly easily. I wouldn't want to do a board that had a lot of these (or even a lot of boards that had only one) as I haven't yet successfully gotten it right without rework. But it is possible to get this style of chip to place if you absolutely need it. As I feared, I am just jinxed when it comes to the hand-soldering phase. I really wish I knew where the problem was. I used the same technique as the practice board: lay down some solder on the pad without flux, put the pins in, then flux and solder. I ranged from a couple of really weak joints, and with most of them the pad just disintegrated as if it was being burnt. Once that happens, solder won't adhere no matter what you do. If you look closely, you can see some of this happening on the reflowed components (top pad on the resistor, pads closest to the crystal on the caps). Those joints seems to work in spite of the problem, but the bar is lower vs a through-hole part. I'm pretty sure my iron isn't too hot, as once it was clear the board was toast, I switched back to the original solder as an experiment. The iron could barely make that solder wire melt, whereas the new wire melted more readily. If it were running too hot you'd think that wouldn't be the dynamic. The only difference I can think of is the practice board has really large oval pads. This gives the heat someplace to go, reducing the risk I'm burning out the ink. It also means if the solder start to leach the silver out of the ink, there's still pad left for the solder to adhere. I'm also being extremely stingy with the flow rate in order to print at this level of fine detail, which causes the height of the trace (and hence the volume of ink) to be less than normal. I like that you are/were running these experiments and posting them! Very helpful! I also am having little luck with the hand soldering. I just got a bunch of SMD headers and reflow them on. I’m new here. 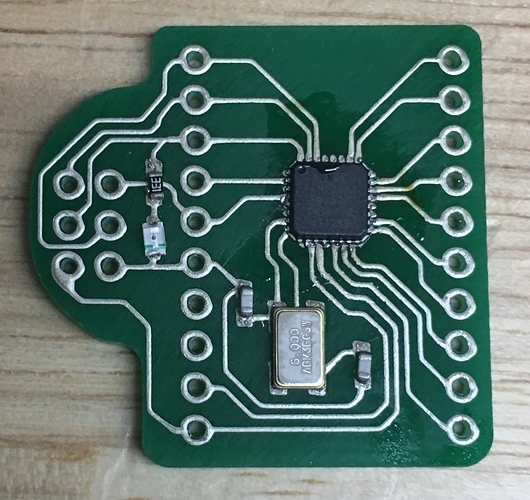 Quick question, do you think it would help if you had a high-temperature plastic “jig” that fit over the components and held them precisely in place during the reflow? I’m interested in doing parts like the ATTINY861, but a little fearful after reading your post. Thinking about ways to get creative and improve the process. The cured ink is a convex surface, so pressure applied to the part is unlikely to “lock it into home position”. Too much pressure might actually cause it to side-slip. I’ve had mixed results with the solder paste adhesion, which pressure is unlikely to affect very much. Tight-tolerance pads make it extra-tricky to dispense the correct amount of paste in exactly the correct locations. Too much and/or not centered enough, you get bridges. Too little and you risk not getting good adhesion. I was thinking a “3-dimensional” jig - i.e. a square recess that fits tightly over the top of the chip and holds it in place (in the XY plane moreso than Z) during reflow so it can’t translate, rotate or side-slip. I’m just spitballing here, I know tolerances would be a question. Or maybe a jig very rigidly attached to a vacuum pickup tool? BTW can the height of Voltera traces be tuned, and do their surfaces get any flatter if you make them thinner?